How Do You Keep Your Devices Secure During The Holidays? It can be a bit more challenging to keep devices secure around the holidays than at other times in the year for a number of reasons. For starters, your inbox is probably inundated with more emails than usual. Every store is running a sale (or two, or three) and sending tons of emails about it, which means you may become a bit less vigilant when it comes to making sure that they aren’t phishing emails. Plus, with the holidays comes travel - and with travel comes connecting to new WiFi networks or using your cellular data in public spaces. Using unfamiliar or unsecure networks can quickly open your device up to the risk of being hacked by the bad guys (not that Aunt Sally is a bad guy, but her WiFi might have some lurking there). So, if you know you’re going to be hit with an onslaught of emails and you know there’s nothing you can do to avoid connecting to different networks, what can you do to protect yourself? Here are a few things you can do to safeguard your devices during the holidays. As you’re checking these emails, the first thing you should do - before you even open them - is look at the sender and the email address itself to see if anything tips you off that it may be a phishing scheme. If it looks off, it may be SPAM. An example of an email address that looks off could be one that rather than being “info@store.com” is “info@ad.store.com.” The addition of “.ad” in the domain is easy to miss but indicates the subdomain could be spoofed and is a hacker’s way into your life. If you’ve taken a look at the email sender and you think it’s legit, the next thing is to be careful about any links you click on. Before you click on anything, hover over it. This will pop-up the URL behind the image without you having to click on it, and you can examine it for anything wonky. Again, look for domains that may be spoofed, or domains that just look completely out of place. Finally, when in doubt just delete the email and report it as SPAM. You may be worried that you’re going to miss out on the deal of a lifetime, but as they say - if it sounds too good to be true, it probably is. And you can always visit the brand’s website or head over to the store to check out the deal for yourself. It will take you a little longer, but could save you hours upon hours of a headache. As you travel for the holidays, one of two things is going to happen - you’re going to connect to an unfamiliar WiFi network, or you’re going to connect to the internet via your cellular data. In either case, it’s important to remain vigilant (do you see a theme yet?). In today’s digital climate it’s more likely than not that most places will have some sort of password protecting their WiFi - but if they don’t, it may be a good idea not to connect. Of course, it seems easier to connect to WiFi without a password (sweet, free WiFi! ), but if their network isn’t secure, you have no idea who, or what, lurks behind. You may also notice that when you’re staying in hotels or using the WiFi in a coffee shop they have you log in to a portal to access their WiFi. Be sure you’re paying attention to the URL of that portal and that it doesn’t ask you for any identifying or payment information. When you’re at a coffee shop it’s unlikely that they’re going to have you pay to access the WiFi since they’re already getting your money from your order. Hotels are a bit different because they do often charge per day for access, but again - this is something that you generally won’t be asked for up front. In most cases, they’ll tack the WiFi charge onto your room bill at the end of your stay, so if you’re asked to input payment information call the front desk to make sure it’s legit. Whether you’re connecting to the Internet via an unfamiliar WiFi network or cellular data, it’s also a good idea to avoid doing anything that has you transmitting or reviewing sensitive data. Don’t send your credit card info through cyberspace or enter (or change!) passwords until you’re back in the comfort of your own WiFi world - or at least on a network you know and trust. 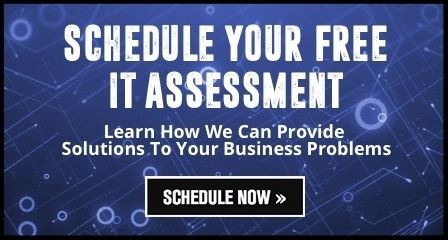 Now that you know what to do to keep yourself safe when you’re away from the office, schedule a FREE IT Assessment to see just how safe your internal IT environment really is.